Our boats over here in the west were starting to move forward and Mr. Morris and his mates got too busy to entertain me. Control boats checked in as each line formed up. This information was relayed to the bombardment destroyers so they knew when to get out of the way, or to continue firing and keep enemy heads tucked down under ground. Radio calls came in at an even tempo, from firm calm voices. Those voices had made the calls before, as they’ve had plenty of chances to practice and perform this act of the play. Boats at 2000 yards. Destroyers finishing last sweep. Boats at 1000 yards. Supporting guns cease fire. First wave still line abreast. Second wave moving on time. The voices wavered only a little as the enemy got in on the act. Boats hit, beach Winton-3. Can you see the gun? First wave dry, Stutz beach. Taking fire, right of Stutz. Air control Winton, can you see it? I stepped outside for a minute and looked down to the main deck. It was heavy with Marines, watching the action to our starboard quarter. They all had helmets and small arms with them, the daily uniform for today’s duty, which was to stand ready as the reserve division and as targets for any kamikaze raid that might come in. I looked toward the beach myself. It wasn’t hard to find, being the source of a lot of noise and smoke. 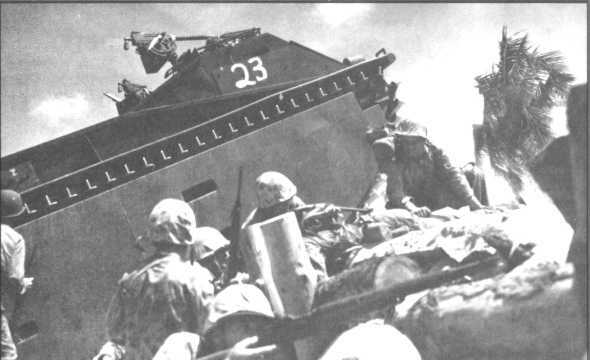 With my field glasses I could occasionally make out armored AMTRACs on the beach, moving inland and to the flanks. I looked up to watch a Navy attack bomber fly overhead toward the fracas. Another plane followed twenty seconds behind the first. Between the two I heard a louder “chump!” from the beach. I looked to the beach again, and the wind cooperated with my field glasses, clearing smoke from my view. I saw two figures leap from a flaming amphibious tank. Other dark shapes around the tank were infantry who had dived into the sand and gravel when the tank was hit. The two from the dead tank moved back toward another group of dark specs behind another two AMTRACs. I imagine there was much yelling and pointing, as the two amphibians split up, steering clear of where their cousin had been wrecked. The view was again obscured as that unit of Marines worked through their first live field problem of the day.